Some PDF documents contain forms that you may need to fill out. 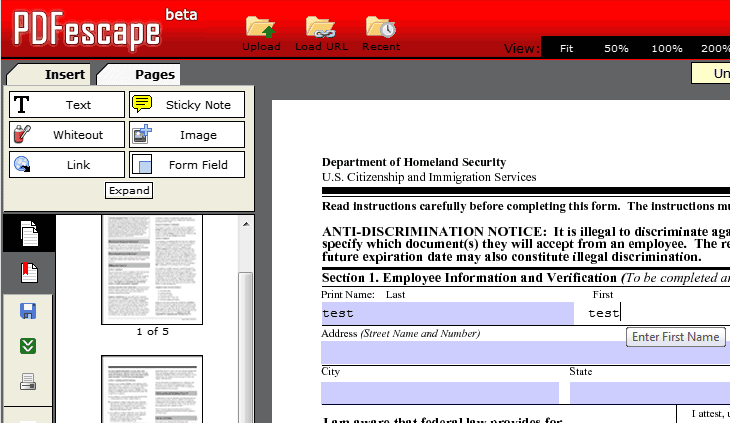 Many computer users print the pdf document to fill out the form manually on the printout. This means more work for the user and a document that looks unprofessional. What many do not know is that their pdf reader is likely capable of form editing so that the document can be filled out on the computer. This guide looks at three tools for the job. The desktop applications Foxit Reader and Adobe Reader as well as the online service PDF Escape. Both the online service and the desktop applications have their distinct advantages, and disadvantages. Foxit Reader is a free fast pdf reader for Windows that offers several extras over the more common Adobe Reader. The free software is faster than Adobe Reader in all regards, which is most noticeable when pdf documents are opened on the computer. 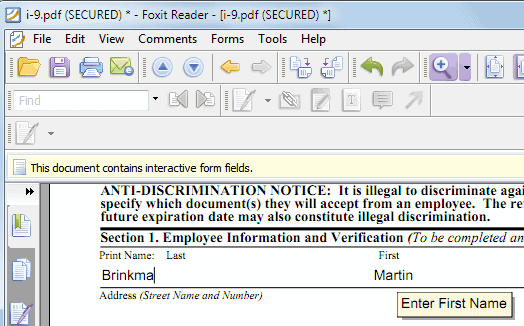 Windows users who want to edit documents need to load them into Foxit Reader to edit the document forms. This is done with a simple click on the form field and the use of the keyboard. Documents that have been filled out can be saved to the local computer system or send directly to the printer or an email recipient. This is all done via the File menu in the menu bar of the application. Windows users can download the latest version of Foxit Reader from the official program website. The pdf reader is compatible with all 32-bit and 64-bit editions of the Windows operating system. PDF Escape is a free online service that offers pdf form filling. Users can upload individual pdf documents that are then parsed and displayed on the service's website. The online tool scans the document for form fields to highlight them automatically when the individual page is loaded. A click on a form field activates it so that it can be filled out. Once activated it is possible to flip through all fields with the tab key which speeds up the processing noticeably. A click on Save and Download PDF generated the filled out pdf document and opens the save file as dialog window to save it on the local PC. It is alternatively possible to send the document straight to the printer. The online service does not require registration, but registered users do get extra features like options to save files online. Adobe Reader comes with capabilities to fill out pdf forms, just like Foxit Reader or the online service PDF Escape. PDF documents that have been filled out can be saved or attached to email. The online service attracts a different audience. It is for instance the perfect solution when you work on a computer without pdf reader, or a pdf reader that does not offer form editing and saving. Which tool or service are you using to fill out pdf documents? Sometimes I use Sumatra PDF for the same purpose. It’s also free. Anybody who is looking for an easy way to append a signature to a form or do any other type of freehand markup, like annotation, will probably like jarnal. It’s great software that’s particularly useful if you have an active digitizer around such as a tablet (not a touchscreen slate, a real tablet) has. PDF Exchange Viewer Free is the one that I have been using for the last 2~3 years and it does excellent job in every aspect. Highly recommended. It seems everyone has his favorite, for me, I have been used the PDFelement for 2 years, besides the editor feature, it also has the OCR and PDF converter features. Says “FREE” but it’s not. Which is scammy. the information provided is quite helpful for anyone. this is really really really helpful. thank you. Try fillanypdf.com – lets you upload any form and make it fill-able online – you can even e-sign it and send it anywhere via secure link – all in a matter of seconds….outstanding tool…when I need someone to fill out and sign a doc I can use it for that too! Free version works great! I would fill out one field, and then fill out the next field. The data in the first field would disappear. Foxit Reader doesn’t work. My screen looks just like the example “…(SECURED)…” nope, doesn’t work. So, I filled out a pdf form online and was frustrated when I couldn’t save it. I ended up figuring out that if I right-clicked, selected print, then changed the destination to “save as PDF” instead of a printer, I could save it with all of the text remaining in the fields. it’s not show me that PDf have any form on latest version. how I can fill it in foxit.